“When paperwork gets in the way of benefits, that’s a problem.” So said John Bemis, Secretary-designate of New Mexico’s Energy, Minerals and Natural Resources Department, appointed by Governor Susana Martinez. What is significant about Bemis’ comment, made during a presentation in front of the New Mexico Oil and Gas Association’s Annual meeting on October 3, is that it represents a total change in attitude from the previous administration and is indicative of the difference one person—at the top—can make. The change in attitude in NM presents a case study from which the rest of the US would be wise to learn. Former Governor Bill Richardson’s approach was very much like President Obama’s. He added regulations and appointed people to positions of leadership who made doing business in the state difficult—especially in regard to natural resource management. As a result, businesses moved to other states and revenues suffered. While some people think one person can’t make that much of a difference, NM is proving that couldn’t be farther from the truth. A culture of growth and prosperity starts with attitudes at the top. Governor Martinez was elected in 2010. She appointed her people to head up the various agencies—including John Bemis at the Energy, Minerals and Natural Resources Department. The rules didn’t change; instead the new leadership reevaluated their application. 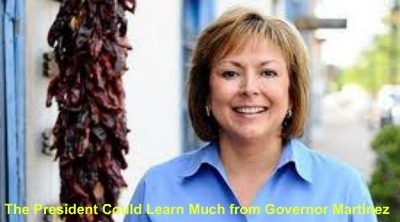 Rather than dictating just because she can, Governor Martinez has chosen to focus where she can get the most bang for the buck. For example, the limited resources of the Oil Conservation Division can now be directed toward actual environmental issues, rather than enforcing paperwork. As a result of the change in attitude at the top, industry is more enthusiastic about doing business in the state. As I usually do during August, September and October, I participated in three state-wide events; the annual meetings of the Independent Petroleum Association of New Mexico, New Mexico Mining Association, and New Mexico Oil and Gas Association. The contrast from previous years in the outlook of the participants was startling. They are excited about the possibilities! Instead of the regulations being used like a hammer to beat down all development, departments are now looking to help folks work within the regulations. If the regulations are excessively punitive or inappropriate, industry is encouraged to submit proposed changes—which they’ve done and which are being considered. Things are picking up in New Mexico. Across the US, we have much the same problem as New Mexico did. We have excessive regulations, businesses are leaving, and revenues are suffering. The leadership has the power to reverse the trend. We’ve seen it in New Mexico. We saw it in August when President Obama instructed the EPA to delay the ozone regulations—which would have been one of the costliest in the history of the US as hundreds of counties would be instantly out of compliance for things as simple as fireworks displays. The EPA has more tricks up its sleeve, and President Obama’s pick to head up the EPA, Lisa Jackson, has no intention of slowing down. On October 10, an unprecedented group of Attorney Generals from 25 different states, joined together to ask Secretary Jackson to postpone implementation of the Utility MACT rule because it threatens to endanger electric reliability, eliminate jobs, and saddle consumers with significantly higher costs. The next day, the EPA issued a statement declaring that the rule would be implemented as planned on November 16. The MACT (Maximum Achievable Control Technology) rule condenses potential future coal-fueled power plant improvements and upgrades into an unachievable timeline. As a result of the Utility MACT rule, electricity providers already have outlined which coal-fueled power plants will be shut down. The remaining plants will have to spend billions for the required overhauls for marginal or questionable benefits to public health. As he did in early September with the ozone regulations, President Obama has the power to tell Secretary Jackson to slow down, delay, or stop altogether. However, without intense public pressure, he is unlikely to do anything. The Utility MACT rule is just one of the expensive rules flowing down from the EPA that will cause America to lose important and cost-effective energy that is essential to economic growth. The higher costs will be passed on to the already struggling businesses and households. It is actions like the EPA’s complete disregard for the public’s outcry, as expressed by the 25 attorney generals, that has pushed Congress to attempt to limit these excessive regulations through the EPA Regulatory Relief Act of 2011 (HR 2250) passed by the House on October 13—which President Obama says he’ll veto should it make it through the Senate. The one person at the top makes the difference. Another example is the Wilderness and Roadless Area Relief Act (HR 1581), which aims to legislatively push what the one person at the top won’t do. There are 43 million acres of federal lands that for decades have been managed as “wilderness”—meaning that potential grazing and resource development is limited, firefighting efforts are thwarted, and recreation and tourism are restricted—despite the fact that these areas have already been studied and determined to be unsuitable for wilderness. The BLM and the Forest Service has recommended that the restrictive management practices be lifted. Instead of encouraging Congress to do so, President Obama’s Interior Secretary Ken Salazar issued an order to lock up more lands with a new label: “Wild Lands”—conflicting with the Wilderness Act which states that only Congress has the right to designate wilderness areas. The Wilderness and Roadless Area Relief Act will remove these lands from limbo and opens them up for multiple uses, while giving local communities a voice in how the lands are managed. Unfortunately, based on their record, the people at the top are unlikely to support the recommendations of the BLM and Forest Service. They will probably choose to keep these lands locked up, blocking economic development and job creation. However, remember, President Obama did order Secretary Jackson to delay implementation of the ozone rules. We can be confident that he didn’t do this because he one day had an epiphany and realized that the regulations were too harsh. He backed down because public pressure was so intense that it became clear his support of the expensive rule threatened his re-election. Ideally, the public pressure changes the behavior of people at the top—absent that, like we did in New Mexico—we change the people at the top. Because, one person can make a difference. Marita Noon is the executive director for Energy Makes America Great Inc. and the companion educational organization, the Citizens’ Alliance for Responsible Energy (CARE). Together they work to educate the public and influence policy makers regarding energy, its role in freedom, and the American way of life. Combining energy, news, politics, and, the environment through public events, speaking engagements, and media, the organizations’ combined efforts serve as America’s voice for energy. Marita’s twentieth book, Energy Freedom, has just been released.